Convention season is rapidly approaching. Time for me to finish up a few things and get ready for meetings and all that. I hope to come out of this convention season with new friends, great stories, and maybe a few new publishing deals. That last one is a long shot, but I have some great things to show and hopefully will find the right people for them. In a few weeks, I’ll be in Columbus for the Origins Game Fair and I have publisher meetings lined up for a few games. Of all the games I want to show, this is the one I’m most excited about. There’s nothing really remarkable about the game, but it engrosses me. I am not going to get my hopes up about finding a publisher, but I am very excited to show it and get feedback. Publishers know the market for this type of game way better than I do and I’d love some insight on it’s viability as a product or whether it needs to change. I still love this game and I’m ready to show it, but I’m not particularly hopeful that it will find a home. 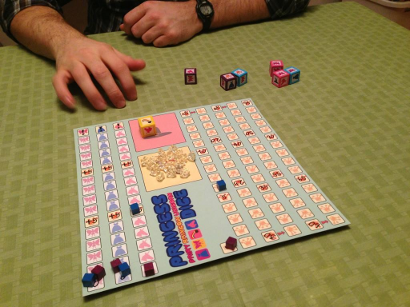 Dice games of the press-your-luck variety seem to be slowly phasing out of the mainstream and I may have missed my opportunity here. I’m going to be honest and say that I think my game offers a level of interaction and strategy that is far beyond many of the games in this category… but that might actually be holding it back. Again, I’m more excited to get market insight from publishers on this one than anything. I’m going to pitch and pitch, we’ll see what happens. I haven’t told a single publisher about Hedeby yet… on purpose. The main reason is… well… it wasn’t done. Truthfully, it still isn’t done… but it will be soon! I had a huge epiphany this week and the game is moving forward rapidly. 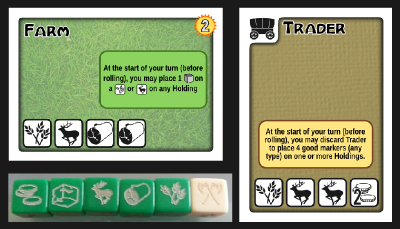 I’ll run a few tests this weekend and if it all works out, I’ll be ordering a prototype from thegamecrafter.com in time for Origins. This is going to be my “back pocket” pitch. The plan is, while going over the games I’ve discussed, is to ask them if they’d be open to me telling them about another idea… and make sure I emphasize that this is nothing more than an idea at this point. This is more of a “test the waters” type of pitch than a full-blown pitch. I just want to get their reaction to the idea and if it goes farther than that, then that’s awesome. So, what has changed? Well, for starters, I cut out half of the game. I fell in love with this project almost immediately. From the very first test, the idea of rolling dice and battling with the other players to buy up cards was really interesting. When I added a second layer, the buildings, it allowed me to introduce mechanics to reduce the randomness of rolling dice and immediately the game shined. The problem, however, has always been the length of the game. So, I cut down on the costs of nearly everything. It wasn’t enough and I became irritated with the design. I knew there was a game in there, I just had to find it. So, I stopped working on it. That’s what I do when I hit a snag. I stop. Eventually, whether I want to or not, I find that my brain somehow comes up with the solution at some point and suddenly I can proceed again. This time around, my brain finally accepted an idea that one of the early testers, Jay Treat, had: why not cut out the Worker cards entirely and have the players buy the buildings directly? And that is what I’ve done. I re-worked the dice and introduced a secondary currency. I removed the worker cards, which allowed me to halve the cost of buildings. That’s something I couldn’t do with cards… how do you spend a half of a card on something? Saying I’m excited for this new version is an understatement. I’m ecstatic that I’ve got a new direction that retains what I loved most about the game. It plays almost identically to the old version, without the frustration. Also, at the shows, I’ll be carrying around Tuesday Night Tanks, Paper Route, and Dead End. I’m not planning on pitching these much, but they’ll be available to show off and play if the opportunity arises. If you are going to Origins and want to meet up, get in touch! I’ll only be there on Saturday, but plan on spending plenty of time enjoying myself. I’ll have my phone and tablet on me all day, so Twitter and Gmail are your best options for finding me.